not only does this include your facial cleansing and moisturizing products, but your makeup as well! i had trouble deciding if this should be #1 or #2… Stop. Using. Soap. On. Your. Face.! our skin is one heck of an amazing organ. it’s our little safety blockade. but in order for it to function properly, our acid mantle must be intact. ok, let’s back up for a little science lesson. skin’s ph is normally acidic, ranging in ph values of 4–6, while the body’s internal environment maintains a near-neutral ph (7–9). this creates a steep ph gradient of 2–3 units between the stratum corneum (the outermost layer of skin, consisting of dead or peeling cells) and underlying epidermis and dermis. the physiologic role of an acidic skin surface is to be a defense mechanism against invading organisms. it has been demonstrated that several key enzymes involved in the synthesis and maintenance of a competent skin barrier are largely impacted by ph. soap cleansers are typically alkaline in nature (ph 10), and have a higher potential to irritate skin (source). [side note – acne flourishes well at ph values between 6 and 6.5, and is drastically reduced at ph values less than 6. what does that mean? do. not. use. soap. on. your. face. ]. the stratum corneum makes up a very thin, slightly acidic film called the “acid mantle” that is secreted from the skin’s sebaceous (oil) glands. this is the barrier that prevents unwanted materials (bacteria, viruses, contaminants) from entering, and excessive loss of water from exiting the body. when we wash with soap, the acid mantle is stripped away, leaving the skin and body vulnerable (source). by using soaps and alcohol (both stripping by nature), you are eliminating your acid mantle, thereby not allowing your skin to function properly (which includes blocking you from the ‘bad germs’). give your skin a break and try the OCM method or water-only washing. your skin will thank you in brightness, clearness, and suppleness! how you take care of your body in terms of nourishment will directly be reflected on the outside. skin flaws are imbalances somewhere, with something, IN your body. 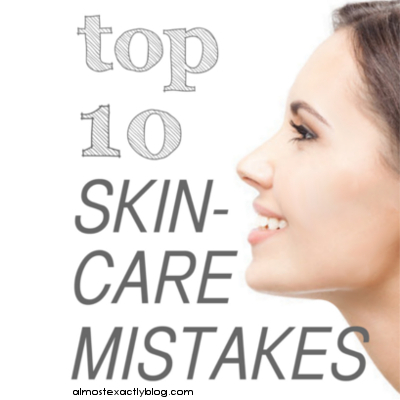 slathering your skin with chemicals will superficially “fix” your skin, but it will not address the real problem. talk to your healthcare professional for all diet and lifestyle changes, of course. not getting enough fats in your diet? you won’t have shiny or strong hair. not getting enough vitamin B? you’ll have ridges in your fingernails. for me personally, the biggest mistake i made was not focusing on what my body’s state was internally, that reflected on the outside. i had to really increase my water intake and address different deficiencies through proper nutrition, and supplementing when necessary (please know that “eating” your nutrients is way better than taking them in a pill). i found that even with my diet, i was needing to supplement with zinc. everyone is different! ask your doctor to check you out for deficiencies, and discuss diet options. i’m a huge proponent of the plant-based diet, with grass-fed meat and butter. yum! poor intestinal health can make skin problems such as psoriasis, eczema and acne worse. by internally balancing your flora, these can get better! you can do this by getting more probiotics into your body. kefir, anyone? yummy! ensuring you’re staying properly hydrated is also important. about 3/4 of americans are chronically dehydrated. that’s crazy! The Institute of Medicine determined an average, healthy adult living in a temperate climate needs roughly 3 liters (about 13 cups) of it a day, and women need 2.2 liters (about 9 cups). the “8×8″ water rule is a great guideline, as long as you’re including other fluids as well. i personally started drinking more water combined with everything else, and definitely noticed a change in my skin. and my body, for that matter. and yes, there is a such thing as overhydration, so don’t overdo it. and last not but least, stress is also an internal factor, which reflects on the outside. take care of your mind, and take care of your body! your skin is an amazing organ; truly. it repairs itself every day, but it needs you to nourish your body in order for it to do its job. you don’t want your skin to become dependent on moisturizers to “normalize” itself. your skin repairs itself while you sleep, and over moisturizing will tell your skin “hey, don’t produce so much oil because we already have all this to work with.” then, the next thing you know, you ‘need’ moisturizer even in the summer because your skin is so dry on its own. on the flip side, truly naturally dry skin needs a little extra lovin’ and needs to be moisturized. and of course, stay away from ingredients like those listed under mistake #1. look for natural moisturizers, like these. for me personally, i’ve found the OCM works wonders and provides the perfect balance of moisture. lso, cotton fabrics absorb moisture, whereas silk doesn’t. if you’re suffering from dry facial skin and rely on overnight moisturizers, try a silk pillowcase. besides, silk feels awesome to sleep on. duh. your body naturally exfoliates itself. yep! it’s a process called desquamation. super sciency sounding, right? the process of exfoliating your skin with scrubs or chemicals serves to irritate your skin to get it to produce newer skin cells faster. what’s the limit? never combine an exfoliant product with a loofah or similar cloth. ever! as far as products or natural diy exfoliators, only use them once a week as the maximum, without risking long-term damage and premature aging signs. also, be cognizant of the condition of your skin after exfoliating. you may find that you need a light moisturizer. a great way to exfoliate and increase the health of your skin and body is through dry brushing. i have a natural bristle brush that attaches to a longer handle, for an all-over body exfoliation. it’s awesome! i can’t stress enough that what goes on your face needs to be clean. even those stretchy headbands need to be washed! your oil and sebum and other dirt will accumulate, and then sit on your skin, leading to blemishes and clogged pores. they need to be washed at regular intervals to avoid breakouts. clean sheets = clean face. don’t get me wrong; sun is great! sun bathing isn’t bad… but sunburns are. so go enjoy the sunlight! your body very literally Needs it. supplementing with vitamin D isn’t the same as getting plain ol’ sunshine. if you need a daily spf for your face, try switching to natural alternative, like these. also, make sure to eat your sunscreen (plenty of healthy fats and antioxidants) and use natural sunscreens when outside for prolonged periods of time, or if you know your burn easily. i know my skin has a very low time limit outside before i start to turn pink, so i always keep some natural sunscreen with me! your skin needs time to “breathe” and repair itself (note: your skin doesn’t really breathe). try sleeping naked if you can! also, make sure to remove your makeup at night with non-toxic removers so your face can properly repair at night as well. just as it’s important to keep your sheets clean, it’s important to keep the brushes that touch your face every day clean as well. over time, makeup brushes accumulate old makeup, oil, sebum, and bacteria. you don’t want to smear that into your fresh morning face, now do ya? keep your brushes washed weekly with a natural soap (castile soap) and let air dry, bristles down. voila! what mistakes are you guilty of? what other skincare tips do you have?? Love this post! Having had acne problems for years, I am so used to washing my face with a facial cleanser and exfoliating each day. I would like to wean myself off of this. I do have a question, is sweat and dirt really washed off with only water? May sound silly, but I feel like I have been conditioned to think only soap with wash sweat and dirt off. What if we’re washing off actual dirt off of our faces? What about something like face paint? Is it okay to soap then?